This is an excellent talk on OKRs (Objectives & Key Results) for goal setting from Christina Wodtke, a consultant who has previously worked with/for Linkedin, Myspace, Zynga, Yahoo, and the New York Times. She goes over how to set OKRs, which were invented at Intel and are currently used a companies including Google, LinkedIn, and Zynga. Objectives are qualitative mission statements – a shoot for the moon goal (Become the best tea provider in Northern California). Set one objective per quarter. Key results are what will result when you reach the objective and are quantitive, not tasks (e.g. revenue of $20k). If the key results are all achieved, you made them too easy. Ideally you’d achieve only some of the key results (0.6 – 0.7 is an ideal score). OKRs are to be used for alignment with a company mission, not for grading an employee in a performance review and therefore people shouldn’t be punished for not achieving them, but rather reviewed to find the right balance of difficulty. It’s a good idea to share OKRs throughout your company and with other people so the team feels a common goal and so the owners of the OKRs can feel accountable. You also might want to check out this video from Google Startup Lab workshop if you’re interested in learning more about OKRs and how they’re being used within Google. Try out our free tool for tracking your goals. 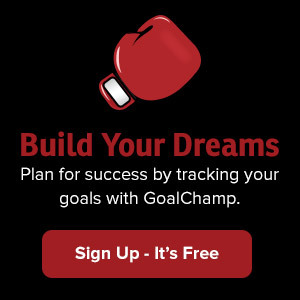 GoalChamp's mission is to help people optimize their lives so they can do awesome things.